Ko David Perenara-O’Connell ahau. I te taha o toku whaea, he uri ahau nō Te Maiharoa, nō Kaurehe, nō Korako Kiwi nō reira ko ōku hapū ko Ngāti Huirapa, Ngāi Paraparatewhenua, Ngāi Te Ruahikihiki, Ngāti Moki, Ngāti Waewae tae atu ki ngā tupuna o Makaawhio. I te taha o toku matua, nō Aerana, nō Kōtarana me Ingarani ahau. Ka noho ahau kei raro i te maunga pou whenua Ōtūmatua, i te taha o ngā waipuna o Tau Awa a Maka, te whenua pākihi Ōwaka. Mai tēnei, ka rere ana ngā wai o Huritini tae atu ki te hapua te waihora, ara, Te Kete Ika a Rākaihautū. Rere tonu ngā wai kahu taipōuri ki ngā pā Orariki me Moki, kei te kāinga o Taumutu. David has been an active member of Te Taumutu Rūnanga since he was a teenager, when he was encouraged and supported by his uncle Te Ao Hou (Ben) Nutira. Soon after becoming involved in rūnanga affairs, he was appointed to the role of Enrolments Officer for the Ngāi Tahu Māori Trust Board in 1993, which was the beginning of a 20-year period of working directly for the iwi authority and his rūnanga. He was one of the first administration and communication officers appointed to work for Papatipu Rūnanga following the settlement of the Claim in 1998. Since then he has moved into management roles within Te Rūnanga o Ngāi Tahu culminating in his role as General Manager Tribal Interests until early 2013. David is now employed by Environment Canterbury as Programme Manager Ngāi Tahu Relationship. 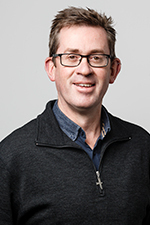 David is passionate about iwi development and in particular the contribution indigenous peoples can make to the long term sustainable use and development of natural resources. This passion is driven by the challenges that Te Waihora/Lake Ellesmere faces as an outstanding coastal lagoon that has been severely degraded and mistreated over the last 160 years. The survival of this water body and all the mahinga kai it supports is vital to the survival of the traditions and way of life practised by the descendants of Te Ruahikihiki and Moki and to the wider hapū of Ngāi Tahu.